I failed to post a MBA Mondays post last monday. Sorry about that. I had something else on my mind when I woke up, wrote about that, and didn’t realize that it was monday and I was supposed to do an MBA Mondays post until late in the afternoon. So we are now picking up from where we left off two weeks ago. Which is in the middle of a four to six post series on projections, budgeting, and forecasting. We covered budgeting in a small company two weeks ago. We are now going to talk about what happens to the budgeting process once revenues start coming in, headcount gets to between 50 and 100 employees, and you are now a full fledged high growth business. Once you have real revenues, 50+ employees, and a real business, you should have a full time finance person on your team. It could be a CFO or it could be a VP Finance. There are tradeoffs between the two. If you think you are going to be an independent company for a long time that will go public or do a large number of private financings and M&A transactions, then you will want a CFO. If you plan to keep the business simple and head for the exits within a few years, a VP Finance should be fine. I should do a post on the difference between a CFO and a VP Finance and I will, but this is not the time for it. So your budgeting process should start with your lead finance person. He or she should run the process with you as their partner. Your budgeting team should also include the leader of your sales or revenue operation and your head of engineering or tech ops if you have one. The way I like to think of these two people is the person who “owns” revenues and the person who “owns” capex. This group is sufficient to run a budgeting process in a 50 to 100 employee company. There are three inputs to the budgeting process in a company of this size; a detailed revenue plan/model, a comprehensive cost model including headcount, and a set of key performance indicators (KPIs). Start with the revenue plan/model and do it bottoms up (meaning identify where the revenue is going to come from and how much of it you are going to be able to pull in during the year). The sales leader will give you a plan that he or she thinks they can hit. Dial it back. As much as I love sales leaders, they are optimists. Very few of them can properly estimate revenue in a high growth relatively early stage company. I believe they generally do a good job of identifying where the revenue will come from but a poor job of estimating how much of it will come in during your time frame. Things always take longer. So dial the sales leader’s numbers back. Then once you have a set of revenue numbers, lay out all the KPIs that it will take to hit them. What is needed from the product team? What is needed from the engineering team? What is needed from the bus dev team? What is needed from marketing, customer service, HR, etc? 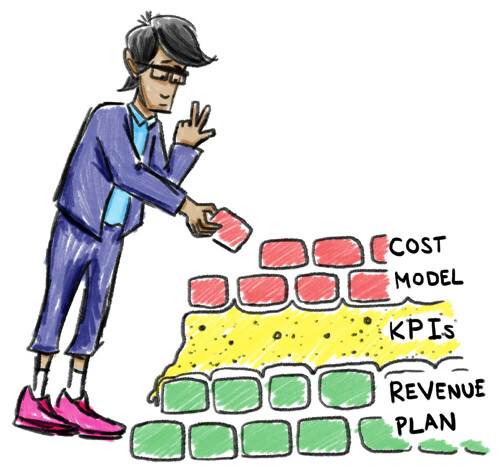 The KPIs are the glue between the top line model and the cost model. Spend a lot of time on this part of the process. Going from KPIs to a comprehensive cost model is not that hard, especially for a seasoned finance person. The key is being comprehensive. If you are growing headcount aggressively, will your current space be sufficient? If not, you’ll need numbers for more space. Things like legal and recruiting costs really start to pile up at this stage. They may not be very large in your historical financials. Plan for them and budge them. And make sure to budget for capex costs. Some companies rent their capex via leases or managed hosting. If you do this, your capex will show up in your operating costs. Some companies acquire their capex with cash. If you do this, your capex will show up on your balance sheet. Either way, capex can eat up a lot of cash. So budget for it correctly and make sure your engineering or tech ops leader is held accountable to the capex budget. In my last post on this topic, I said that budgeting time is October and November so that the board can approve it in December. That is generally true for a 10 person company but not for a 50 to 100 person company. I like to see budgeting start in September for a company of this size and I like to see the Board look at the budget in November. That way if there is a disconnect between management and the Board, another revision to the process can occur before the year starts on Jan 1st. The budget is not just for the Board. It is first and foremost for the team. So make sure to share the budget with the team and make sure they are all bought into it. If they are uneasy about it, listen to them and don’t force a plan on the team that they do not think they can hit. A company at this stage will have a senior team and they should be accountable to the budget. They may even have incentive comp associated with the budget goals. I like to see the entire senior team participate in the budget presentation to the Board. I like all of them to talk to their parts of the budget. That shows they understand it, they have bought into it, and they are behind it. To be brutally honest, very few budgets are met in companies of this size. These businesses are still very much in flux and things change a lot during a year. But I still believe in the value of doing budgets. The process is incredibly helpful in establishing what can be done and what can’t be done. It focuses the mind and the company. And if you realize half way through the year that you are not going to meet your budget, you can and should do a forecast. We’ll talk about that in a few weeks. Next up is budgeting in a 150+ person company. We’ll do that next Monday assuming I don’t have another brain fade. Do you happen to know how many of your portfolio companies lease their hardware/are in a managed hosting environment vs purchase through cash Fred? As Carl pointed out hire one less admin that concentrates on spending money. Carl, I would also say if you show up and find out somebody bought (probably leased) a huge copier you need to sound the panic button. This article was originally written by Fred Wilson on May 24, 2010 here.